I am fascinated with how ideas and projects come together. I often wonder if there are really coincidences, or events are simply stages in a process that we have yet to recognize. This is definitely the case with the sketch I shared with you two weeks ago. Transitioning from that sketch to art quilt has been anything but easy for me! I had a fleeting vision of my finished piece in my mind but every time I looked through my stash and begin to select fabrics, I faltered. I actually made it through cutting and stitching about 20% of the piece once. Hmmm. I found myself dreaming about the colors at night, stopping mid-stream in daily tasks to consider an idea. Clearly this piece was demanding to be completed. Slowly the pieces have been coming together. Back in September, I picked up a table runner at an open market in India. I loved the colors - a bit like a sampler in embroidery. I had no real need for it but some impulse made me purchase it. It has been sitting on our dining room table since September and I walk by it maybe 20 times Adam. Yesterday, as I was preparing for a weekend trip, I once again walked by that table runner again. But this time I paused and saw it in a totally different light. The colors and values that had been flashing in my mind for my art piece were staring me in the face. 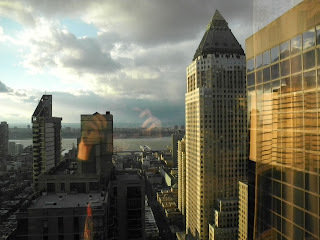 Later in the day, I looked out of New York hotel room at our view and there were some more hints for my piece. Since then I have gotten a few new fabrics that I saw on the web that build off the turquoise in my table runner but lack the subtlety of the effect in the table runner. So, who knows what exactly I shall finally decide. We are off to Hawaii for a few days and I plan to take the project with me to start fusing. I can't help wondering what the trip will contribute to the completion of my quilt. 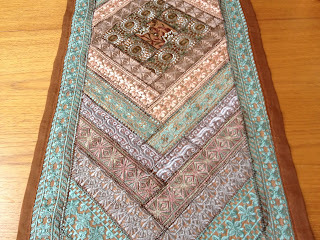 The table runner is stunning! And, it looks to me, made of lace layered over fabric. Perhaps sheers would add a layer of subtlety to what you have in mind? Have a lovely trip, Judy! Wave to me as you fly west over Alberta! I love that runner...and look forward to seeing what it has inspired in you!